When it comes to the use of installed packages through Cydia, more often than not the best and the most popular packages are the ones that are most easy to use and least troublesome to setup. When a developer comes up with something that is not only simple and useful, but also requires no configuration and just works right out of the box then it will definitely become a popular addition to any jailbroken iPhone or iPod touch. In my opinion, the SpotDict tweak definitely falls into that category and although it isn’t going to set the world alight with staggering functionality, it really doesn’t matter in this instance. The name of the package is derived from the words Spotlight and Dictionary, and when installed, it gives the almost-useless Spotlight search screen a new reason to exist, albeit a minor one. 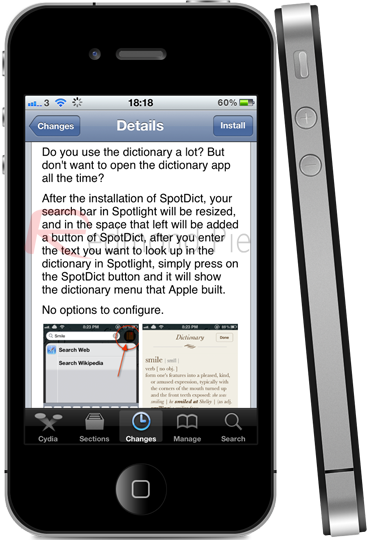 Ron Melkhior’s SpotDict doesn’t come with any home screen icons or additional settings entries, but does alter the size of the search bar in Spotlight search in order to fix a new dictionary button to the right hand side. 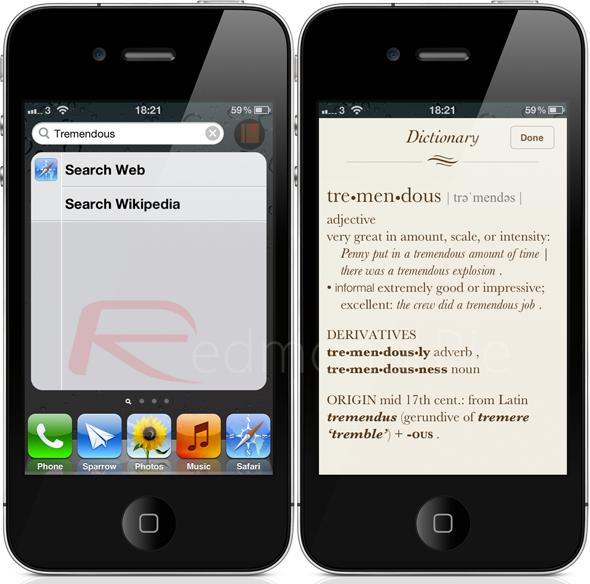 The purpose of the tweak is to allow users to quickly search for words using the native Spotlight search bar, and hitting the dictionary button performs a search for the definition of the supplied word, and also throws back derivatives, and lastly the usage of the word in a sentance. It is essentially negating the need to open up a separate dictionary app, and anything that saves users time is sure to succeed. The dictionary definitions which SpotDict supplies are provided directly from Apple’s own integration of dictionary services, which means that SpotDict is essentially providing an alternative, more easily accessible way to access parts of iOS. I personally had never made use of this part of the operating system before but will certainly use it going forward. SpotDict is available as a free of charge download from the BigBoss repository and requires an iPhone or iPod touch running iOS 5 or above. The developer has also specified that the SpotDict tweak does not come with support for the iPad at this time.